The Coral Triangle is the most diverse marine region on the planet, matched in its importance to life on Earth only by the Amazon rainforest and the Congo basin. Defined by marine areas containing more than 500 species of reef-building coral, it covers around 6 million square kilometres of ocean across six countries in the Indo-Pacific – Indonesia, Malaysia, Papua New Guinea, Philippines, Solomon Islands, and Timor-Leste. This centre of marine life shelters thousands of whales, dolphins, rays, sharks and six of the world’s seven species of marine turtles and directly sustains the lives of more 120 million people. It contains 500 or more species of reef-building coral and is home to 75 percent of all coral species known to science and more than 3000 species of reef fish and commercially valuable species such as tuna. WWF has been pioneering conservation in the Coral Triangle for more than two decades, collaborating with partners in the private sector, governmental agencies and civil society. By providing technical expertise and funding, and promoting innovative public-private partnerships, WWF is committed to ensure that the Coral Triangle Initiative catalyzes measurable changes. 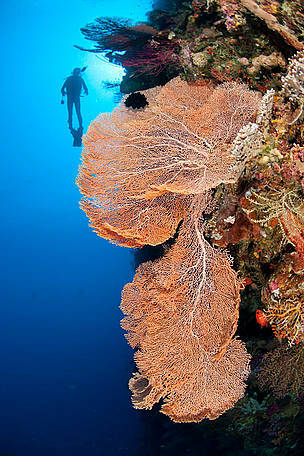 Diver swimming above a gorgonian fan coral during a wall dive. Wanci underwater, Wakatobi, South Sulawesi, Indonesia.